AFC - 09/08/05 The Circus of Shame is Back! 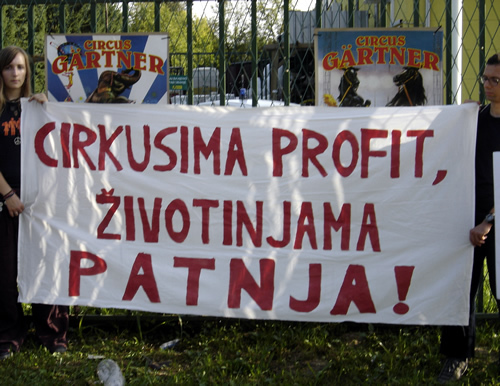 Last year in Sisak, activist of Animal Friends with the great support of conscientious citizens protested against the circus Gärtner that maintains animal acts, while protests against the same circus also took place in Krizevci, Dugo Selo, Velika Gorica, Samobor, Karlovac, Umag, Pula, Labin, Zadar, Sibenik, and Vir. After, to the shock of the public, the circus spent a whole week on the Island of Vir which doesn't have waterworks, Gärtner continued its tour by returning to Sisak again to the disgrace of the whole town. Even though we believe that many townsmen of Sisak are now more aware of the cruelty of the circus with animal acts, we announce a protest and invite them all to show their compassion to the animals of this circus. 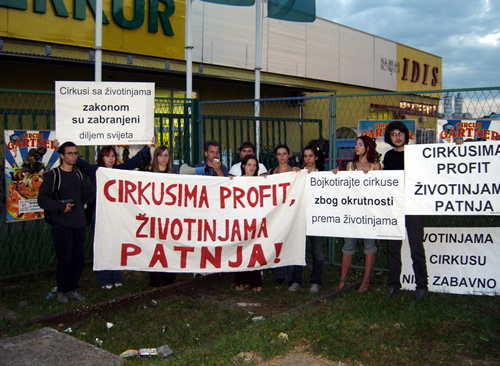 The protest will take place in front of the circus at the parking lot of Idis, Obrtnicka 10, in Sisak, on Thursday, September 8, 2005, beginning at 4:30 P.M. Holding banners, shouting slogans, and handing out leaflets, activists will invite the public to boycott circus shows and the cruelty hidden behind them. The protest will be repeated at 7:30 P.M. as well, before the beginning of the second show. It is a disgrace for Croatian towns to allow circuses with animal acts to perform, especially where lack of culture in human relationship toward the animal are hidden behind animal acts in circuses. World famous circus Cirque du Soleil from Quebec has shown that circuses can function without animal acts. "We do not agree with training animals to perform tricks. We prefer giving that job to human beings," said Pierre Parisien, a member of the renewed group Cirque du Soleil from Quebec, which has developed a circus renaissance all over the world. "Those are animals, not performers. They should be in the jungle," said the art director of the group. "We don't agree with the way the animals are trained and I'm not sure that elephants and tigers have to spend half of their lives in cages and performing tricks around the world," he said. "We won't have animals in our shows ever again." There are no legal regulations regarding treatment of circus animals, their living conditions, transport and the whole range of acts they perform. Let's not forget that they are wild animals that are, naturally, not used to travel, experience different climates, do performances and live in confinement. Animals are transported in trucks too small for them, regardless of weather conditions and their natural needs. Besides the physical abuse animals suffer during training, they also live in constant stress, because they were torn away from their natural environment and forced to work in "show business." For the animals show business is the world of constant captivity and performing of difficult and pointless acts. Animals in circuses are miserable victims of man's manipulation, with their physical, social and other needs totally ignored for the sake of profit. 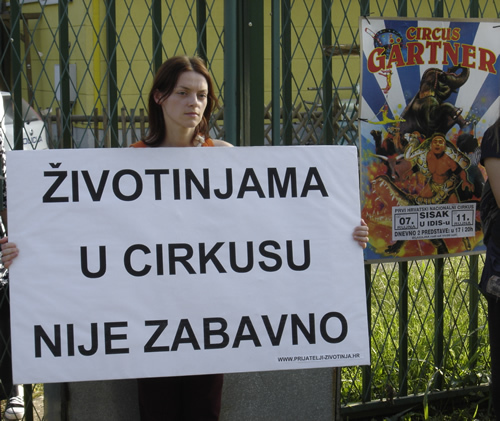 Animal Friends campaigns on changing of the Animal Welfare Act of Croatia, as well as on banning of circuses with animal acts, which are being banned all over the world. However, independently of legal bans, we would like to appeal to all Croatian towns to out of theirs own initiative join hundreds of cities worldwide which already banned performances of the circuses with animal acts. Some of the cities and countries with such bans are Venice, Barcelona, Singapore, Greece, United Kingdom, Sweden, Finland, USA, Israel, Australia, Austria, Belgium, Costa Rica, India, and Denmark. The reasons for this ban are extreme cruelties which circuses use during training of circus' animals, their transport and keeping.